A championship team is in search of a new coach. Seton – La Salle’s boys lacrosse team was informed that their coach has left to become head LAX coach for Upper Saint Clair’s team. It was an unexpected surprise. Coach Brian Yates came to the new Rebels LAX team just one year ago and quickly formed them into one of the best high school teams in Pittsburgh. The Rebels are so good, in fact, that they won the Division II WPIAL championship title during the 2013 season. It was an impressive feat for the team, however, it was definitely expected. Yates worked with the Rebel Boys LAX to set the goal, and worked with them every day to get that much closer to it. “Every day we are climbing the mountain boys. We are that much closer to the top,” Yates used to tell the team every day to get them motivated. He told the team that he loved them like a second family, and that he was so proud and thankful that he had every kid on that team in his life. The team believed him then and appreciate everything he did for them. Even though some of the players may not be too happy of his defection, we assume Yates had to ultimately do what was best for his family and him. When asked if the team could possibly match up against USC, junior midfielder, Mark Williamson stated, “I think we could compete against USC and I believe if we did, it would be a great game”. Senior defenseman, Frank Shepard, said, “It would make it even more fun to beat them”. Senior goalie, Kevin Hudson was asked the same question. 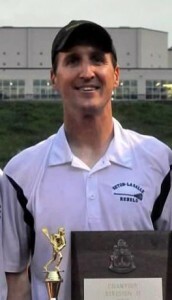 He stated, “I think no matter who the coach is, we have the talent and senior leadership to repeat WPIALS”. These were just some of the opinions expressed by players on Seton-La Salle’s boys lacrosse team. However, only time will tell what really is in store for the team. What can be confirmed, is that they will miss their coach and the whole team was sorry to see him go. Thanks for a great 2013 season, Coach Yates!